Last week, Walking Dead executive producer Gale Anne Hurd acknowledged that the negative response to the extremely graphic show’s seventh season premiere caused them to tone down on the violence for the following episodes. This week, two other executive producers deny that happened. So someone has to be lying. In the season seven premiere, after a summer of promoting the question of who was going to die at the hands of Negan, The Walking Dead came back and showed two characters getting murdered with a barbed-wire-covered baseball bat in intense, gore-filled detail. It was graphic enough that some fans of the show, used to some pretty gruesome stuff, complained that it had crossed the line. Her statements seemed to be backed up by a show that was noticeably tamer throughout the rest of the season. Save for one graphic disemboweling in the midseason finale and a character getting shot in the eye—and that is pretty tame for The Walking Dead, which usually puts dozens of deaths on screen and lingers on both the trauma and the gore. Plus, as noted by Entertainment Weekly, actor Joshua Hoover (who played one of season’s victims, Fat Joey) has said that a graphic bit of violence he filmed was cut from the final product. 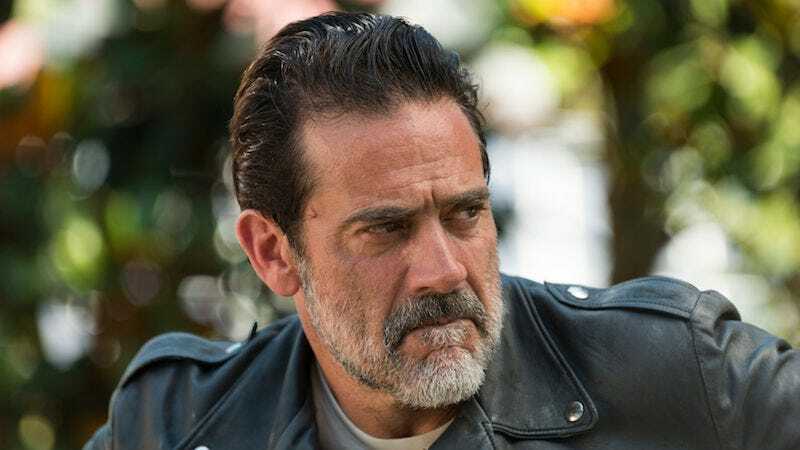 Now, showrunner Scott Gimple and executive producer Greg Nicotero are telling Entertainment Weekly that none of what Hurd said is true. Gimple claims that the over-the-top violence of the premiere was always meant to stand out and wasn’t ever meant to be a baseline. More particularly, asked if a scene where a character gets an iron pressed into his face was cut around because of the complaints, Gimple answered, “Specific to that scene, I guess specific to everything, no.” Which is a pretty definitive answer to whether the complaints affected how things were cut. So, on the one hand we have Hurd saying that yes, they heard the fans and responded to their complaints. And certainly the rest of the season showed less violence overall, On the other hand, we have Gimple and Nicotero saying that everything we saw was always what they planned, that the show’s artistic integrity wasn’t affected by outside forces, even when those forces were fans. Someone isn’t telling the whole truth here. Which one you believe is going to rest on which version of these events you believe—that the show is in flux or that there is an overarching plan that was never touched. In all likelihood, it was something in the middle. I bet the premiere was meant to be over-the-top, but I also bet Hurd probably did ask, and get, some changes based on audience feedback. But given how The Walking Dead crew has handled things in the past, I doubt we’ll get a straight answer anytime soon, if ever.